Porsche Junior Matt Campbell (Fach Auto Tech) finished his first race in the Porsche Carrera Cup Deutschland as the winner. 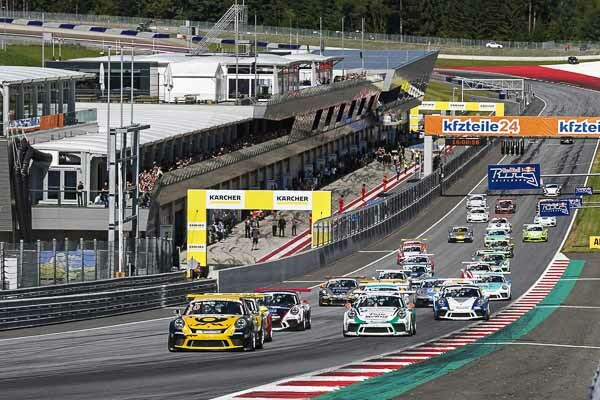 Competing as a guest driver, the Australian won round five of the national one-make cup series on the Red Bull Ring ahead of Larry Ten Voorde (Team Deutsche Post by Project 1) from the Netherlands and Germany’s David Kolkmann (Team Deutsche Post by Project 1). Campbell used the race as a test run for the Porsche Mobil 1 Supercup. In early July, the 22-year-old will compete on the Spielberg circuit as part of the support programme to the Formula 1 race. “My first win in the Carrera Cup feels fantastic. Because of the late safety car phase my advantage suddenly disappeared, but I didn’t let it throw me off balance,” said the Swabia resident. After planting his 485 hp Porsche 911 GT3 Cup on the first grid spot in front of 31 vehicles, Ten Voorde managed to defend his pole position after the start. Behind the 20-year-old Dutchman from Boekelo, Campbell fended off an overtaking attempt by Florian Latorre (FR/Martinet by Alméras) to initially retain his position in second place. Campbell then closed the gap to Ten Voorder and finally snatched the lead in lap three. At the front, Campbell proceeded to pull clear of the field until a collision in lap ten brought out the safety car and the field closed up. Campbell, however, kept his cool and, after the restart, gave Ten Voorde no chance to overtake. “The start went perfectly for me, but maybe I wanted too much. It’s a learning experience, but I’m thrilled with my podium result,” said the rookie from the Deutsche Post by Project 1 squad. In the final laps, spectators were treated to gripping race action to the last corner of the 4.326-kilometre circuit. At the flag, David Kolkmann secured the third podium spot. The 20-year-old German overtook his teammate Nick Yelloly (GB/Team Deutsche Post by Project 1) in the final lap. “This is my first podium in the Porsche Carrera Cup Deutschland! After the restart I pulled out all stops in the last corners,” declared Kolkmann. Fifth place went to Christopher Zöchling (A/MRS GT-Racing) ahead of Porsche Junior Dennis Olsen (Konrad Motorsport) in sixth. “I got off the line well, but the race was really tough because of the close competition. I didn’t want to take any more risks and I’m happy with sixth place,” said the Norwegian.